Innovative projects start with a great research mentor. Leverage UCSF's rich research community to collaborate with experts. Find research mentors matched to your research interests. Learn how scholarship can advance your medical career. Review posters from previous symposia. 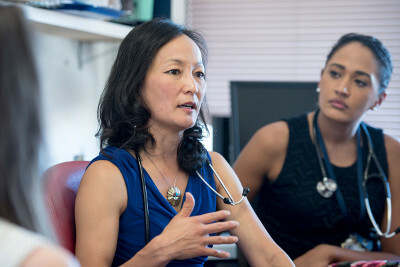 PROF-PATH: “Promoting Research Opportunities Fully – Prospective Academics Transforming Health” is a program of the Inquiry Curriculum and the UCSF School of Medicine led by Dr. Alicia Fernandez. It is designed to create research opportunities and to offer innovative career development support for underrepresented in medicine medical students interested in research in any area, and to any student interested in health disparities research. Inquiry Symposium: An annual event that showcases learners' innovation. 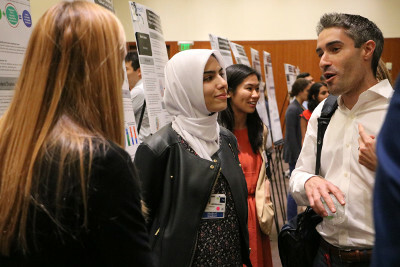 At this year’s Inquiry Symposium and Pathways to Discovery Awards, over 100 medical students, mentors, faculty and staff gathered at the Parnassus campus to learn about the latest research led by students and residents from the UCSF schools of Medicine, Dentistry, Pharmacy, and Nursing. Browse the posters from the 2018 Symposium. The Inquiry Habit of Mind: How can we train physicians of the 21st century to address and manage health problems that have not yet emerged? How do we prepare our graduates to use tools, technologies and treatments that have not yet been invented? Watch a video to learn more. Video from Elizabeth Bayha on Vimeo. Unlike traditional medical school content, Inquiry Curriculum teaches a “habit of mind.” Because of this, it has been applied within all phases of the Bridges Curriculum and is composed of three distinct steps. 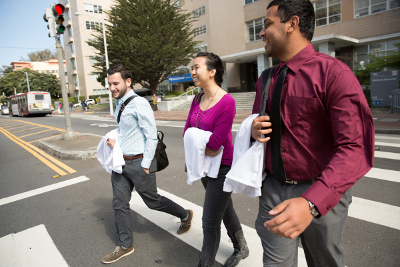 Inquiry Immersion: Two-weeks of research-focused didactics, scholarship skill-building experiences, and selective Mini-Courses presented by preeminent UCSF faculty scholars integrated with learners from the School of Pharmacy. Through this component, students continue to refine skills in inquiry, connect to a community of practice, and begin planning of their own independent scholarship. 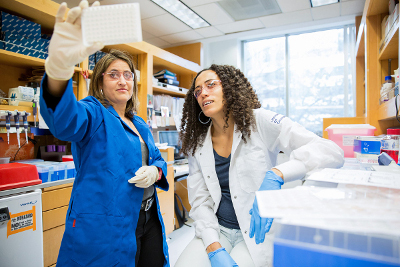 Deep Explore: Up to 20 weeks registered time during the Career Launch phase when students conduct focused, mentored research with a UCSF faculty member on a topic of their choosing. While some students may enter the Biomedical or Clinical Science Domain, scholarly projects range from any of the health sciences. Community health, health systems improvement, population health work in under-resourced areas, and high impact medical humanities projects are just some of the non-traditional areas in which UCSF students have made a meaningful contribution with this requirement.